Purchasing call center furniture can be a challenging process, but it doesn’t have to be. Finding the right furniture design to accommodate business goals, like increasing communication and productivity, is doable when you work with a company that specializes in customer service focused spaces, like call centers and contact centers. Purchasing your office furniture from a manufacturer that focuses on call center furniture provides a number of productivity benefits to employers. 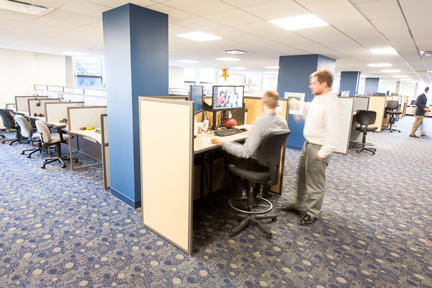 For example, these manufacturers create raised office stations specifically for team leaders and call center managers. These raised height of these desks enables supervisors to observe, manage, and communicate with their employees. Experts say that the more supervisors and employees talk, the more productive a business becomes. Customized call center furniture can lead to a more productive workplace. To select the best furniture for your office, start by picking the panel height of the desks. Office workstations with a panel height between 40 inches and 42 inches give a supervisor the best view of his or her office while providing employees with some privacy. An option to add more privacy, but keep visibility, is to outfit workstations with unique acrylic panels and decorative elements. These creative embellishments bring a unique visual appeal to the office without sacrificing visibility. Another important thing to think about when designing your call center furniture is the color of your office cubicles and desks. Studies show that the color of a space can influences the productivity of the employees. It is often recommended to select neutral colors for the office desks, and spruce up these neutral desks with colorful chairs, paint, art, or vivid work accessories. The dimensions and layout of your workplace furniture also impacts the productivity of the office. The most dynamic office floor plans leave adequate space for collaboration, break rooms, and training areas. An adequate floor plan also leaves plenty of aisle space for supervisors to reach their call center agents easily and efficiently. Creating several pathways to the center’s restrooms and exits are also extremely important. If you are moving for expanding, get stared on your design today. We are an industry leader in designing, manufacturing, and installing furniture for call center and office environments. Drawing from decades of experience in designing and manufacturing high quality, made in the USA commercial business furniture, we are your #1 choice for call center and office furniture. Contact us to start a free, no obligation quote at 800-678-5550, or fill out the Request A Quote form on this page.